At​ ​this​ ​stage​ ​of​ ​the​ ​course​ ​you​ ​should​ ​be​ ​immersed​ ​in​ ​your​ ​research​ ​project.​ ​In​ ​order​ ​to​ ​bring​ ​this experience​ ​into​ ​the​ ​studio​ ​we​ ​would​ ​like​ ​to​ ​see​ ​a​ ​creative​ ​response​ ​to​ ​your​ ​research​ ​so​ ​far. You​ ​are​ ​asked​ ​to​ ​make​ ​a​ ​one​ ​minute​ ​film.​ ​This​ ​can​ ​be​ ​a​ ​visual​ ​exploration​ ​of​ ​the​ ​subject​ ​matter,​ ​or​ ​a presentation​ ​of​ ​your​ ​argument​ ​or​ ​hypothesis. See​ ​it​ ​as​ ​an​ ​opportunity​ ​to​ ​tell​ ​us​ ​what​ ​you​ ​now​ ​know​ ​about​ ​the​ ​subject​ ​matter. The​ ​format​ ​could​ ​be​ ​sequential​ ​images​ ​(like​ ​a​ ​slide​ ​presentation),​ ​an​ ​animation,​ ​or​ ​film.​ ​The​ ​work​ ​must clearly​ ​communicate​ ​by​ ​itself​ ​-​ ​we​ ​do​ ​not​ ​want​ ​to​ ​hear​ ​you​ ​speak! It​ ​could​ ​be​ ​as​ ​diverse​ ​as​ ​visual​ ​imagery​ ​edited​ ​to​ ​sound,​ ​filming​ ​yourself​ ​narrating​ ​a​ ​summary/explanation of​ ​the​ ​subject​ ​matter​ ​or​ ​a​ ​voice-over​ ​accompanying​ ​the​ ​film. Try​ ​to​ ​make​ ​your​ ​work​ ​as​ ​creative​ ​as​ ​possible,​ ​please​ ​don’t​ ​see​ ​it​ ​as​ ​a​ ​dry​ ​explanation​ ​to​ ​be​ ​seen​ ​only​ ​by tutors,​ ​have​ ​fun​ ​visually. To begin the dissertation process we were asked to fill out a proposal form detailing our ideas so far. 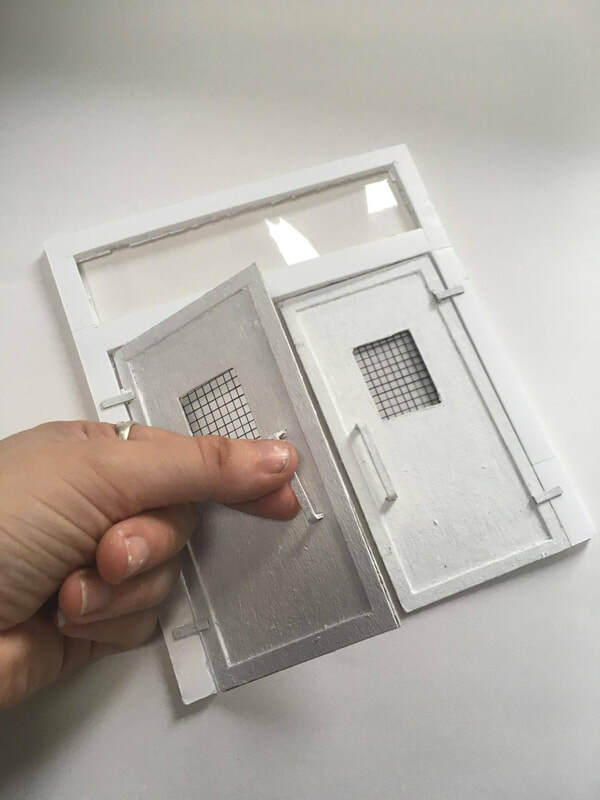 I had surprising success with the previous essay in which I spoke about heterotopia and architecture focussing on an episode of Black Mirror and Exodus: The voluntary prisoners of architecture by Rem Koolhaas. 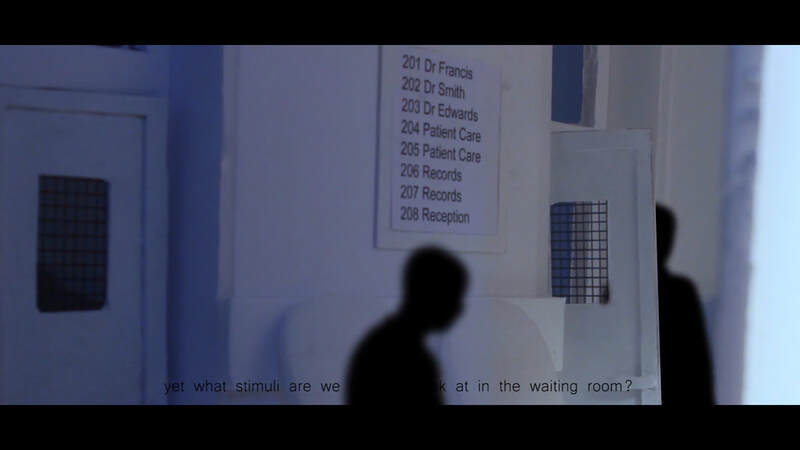 I became really engrossed in the control architecture has over our behaviours and therefore want to continue this exploration along a similar theme with the focus on medical spaces and their impact on our health. I wrote the following on my proposal form. 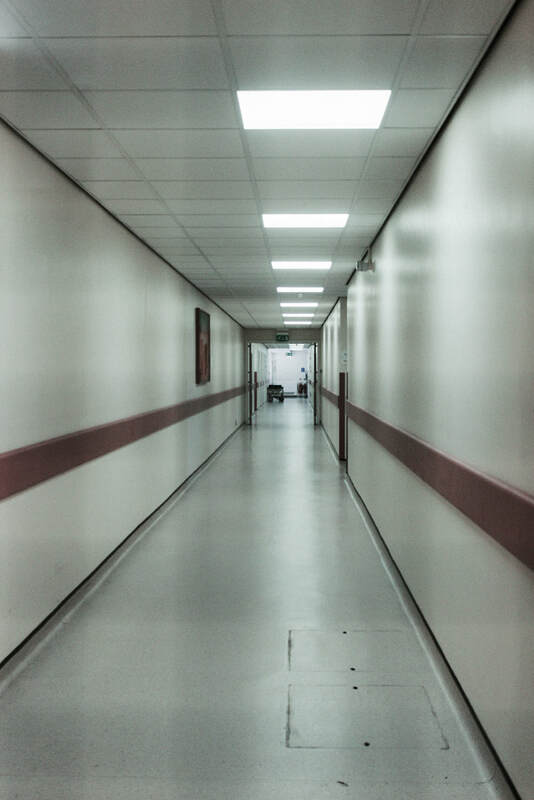 The hospital’s ambiguous relationship to everyday social space has long been a central theme of hospital ethnography. 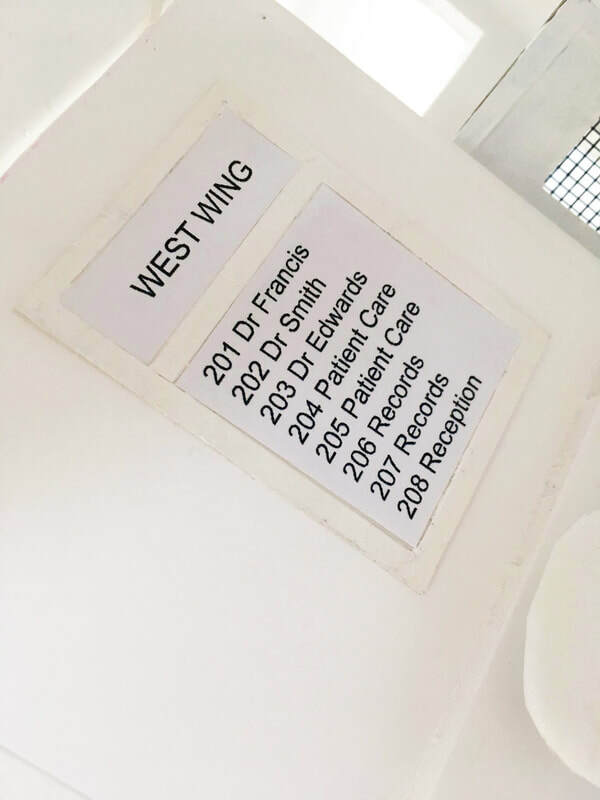 Often, hospitals are presented either as isolated spaces defined by biomedical regulation of space and time or as continuations and reflections of everyday social space that are very much a part of the ‘mainland’. I want to explore this space of hospitals, in particular waiting rooms as a heterotopia applying Foucault’s theories of ‘other places’. 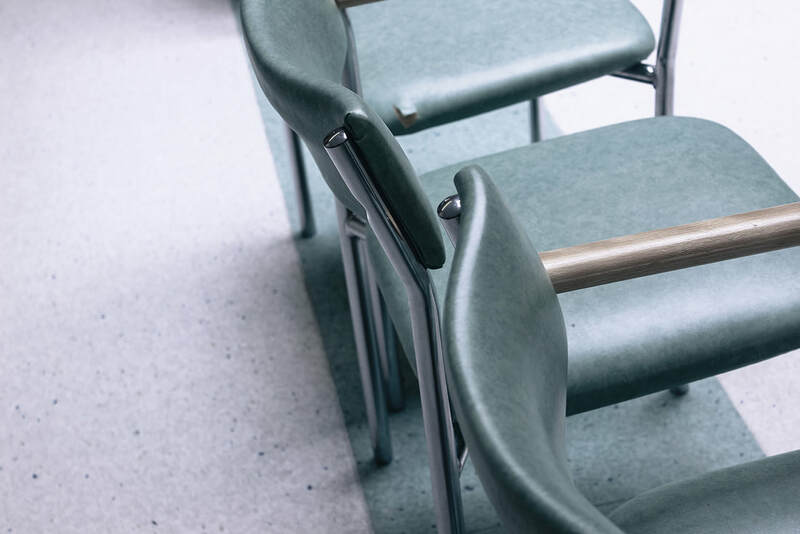 It is common that people’s experiences and expectations highlight feelings of powerlessness and vulnerability when in positions of the patient, family, friend or caring bystander. 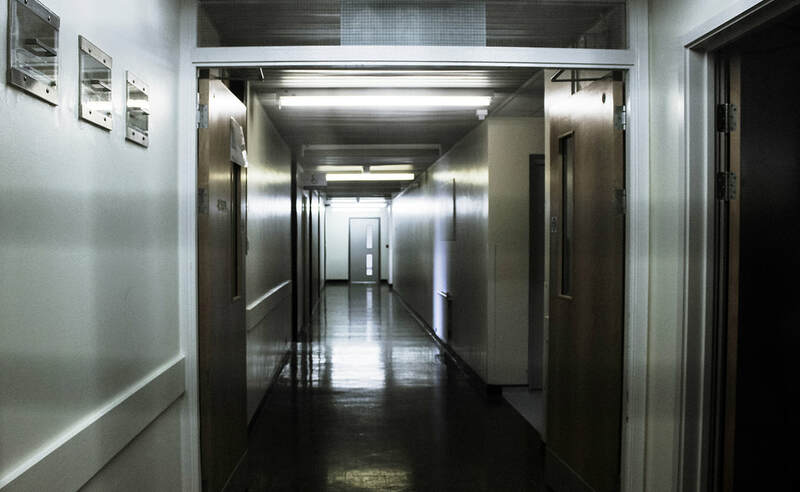 I am fascinated with the architecture of space and wish to explore the importance of liminality in hospital corridor/waiting areas, and how through design interventions, such as temporality of shadows, voice and scent, could aid personalisation of such transient spaces to engage those that pass through, sit and wait, with interior elements that enhance feelings of well-being.n faces (Darwin,  1965). 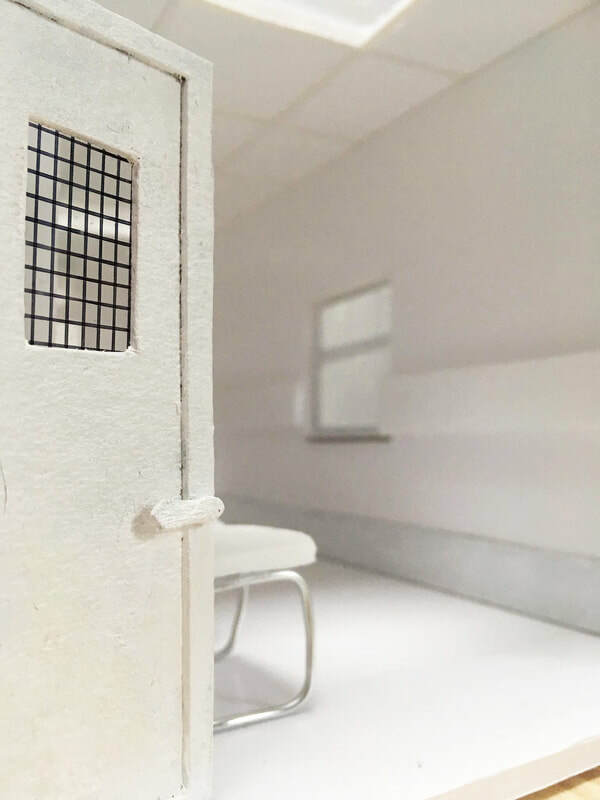 ​Over the summer I continued research and found an interest in a few aspects of medical architecture which I could visually illustrate for this project. 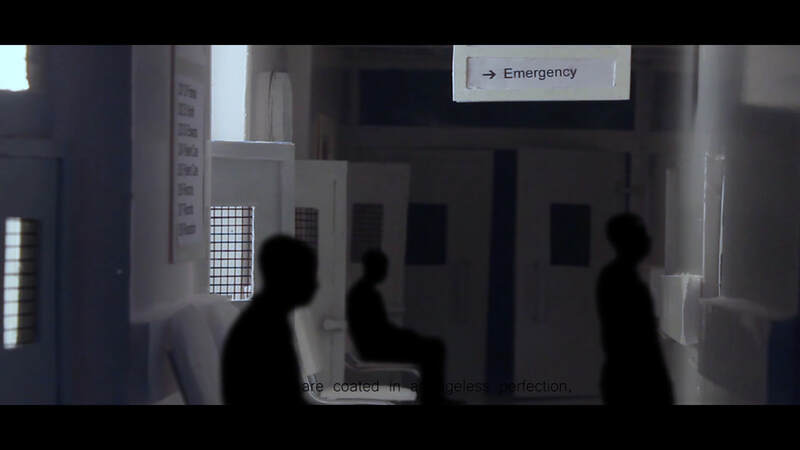 My plan is to construct a 3D model of a hospital corridor/waiting room with details alluding to my areas of research. 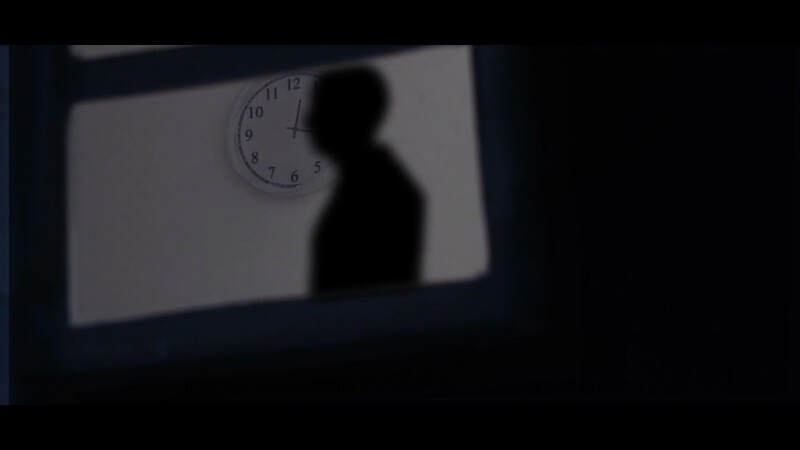 To present this I plan to greenscreen silhouetted figures of people occupying the space. They will fade away from time to time to allude to their deaths since the architecture of hospitals is strongly associated with aesthetics of death. I will also atmospherically light the space through windows and ceiling lights. 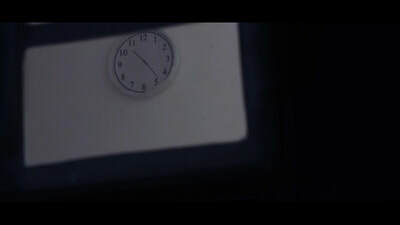 I could show this with a simple model clock on the wall. 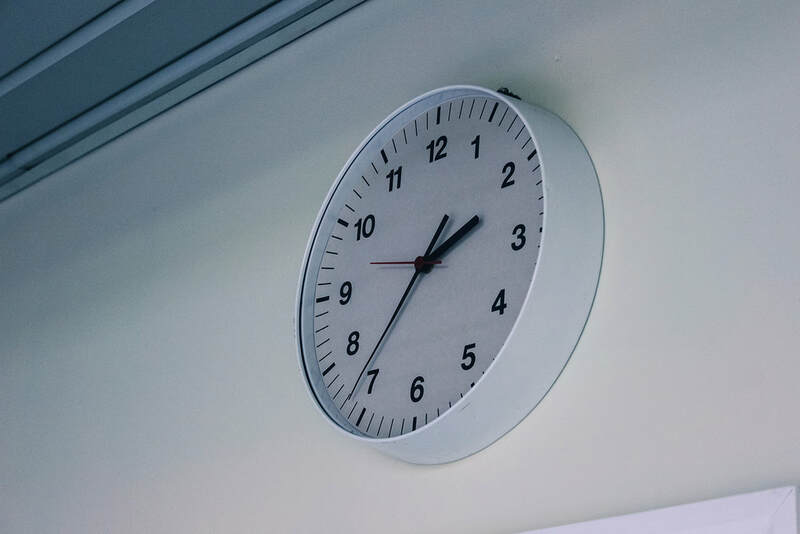 The hands could move quickly, fading from hour to hour to suggest how time passes slower in the environment. ​It is common knowledge that hospitals attempt to hint at life and happiness in the artwork that appears on the walls in hospital spaces. 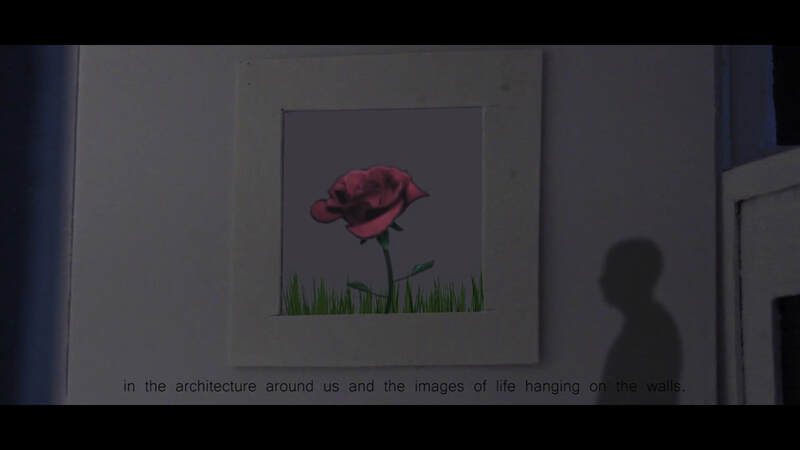 We often see floral images or landscape hanging on the wall yet feel some sort of unease in their connection to the architecture which so clearly resembles death. 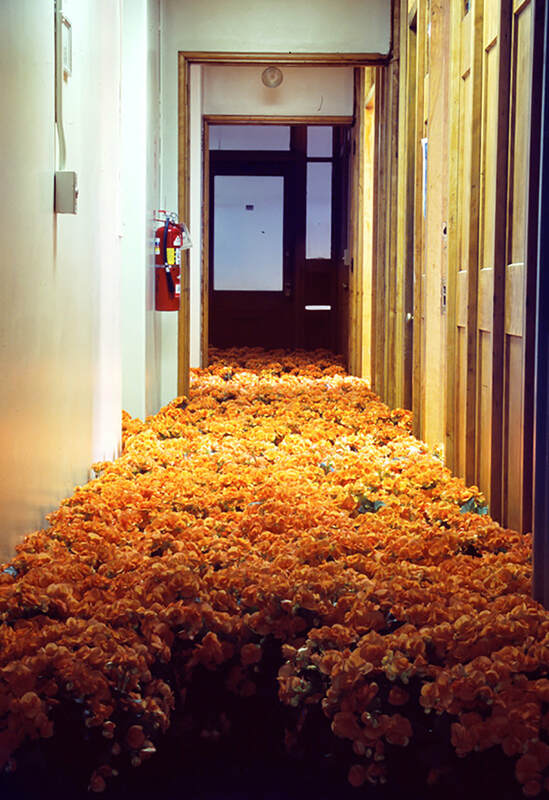 I plan therefore to have plants and flowers growing around the walls/floor to create this juxtaposition. Over the summer I visited a number of my local hospitals to photograph their interior architecture. This proved more difficult than I anticipated due to permission however the photographs I took really sparked my interest into the subject and got me excited about learning about and writing my essay. The hospital below was virtually empty when I visited and therefore allowed my focus to subject totally to the surroundings. 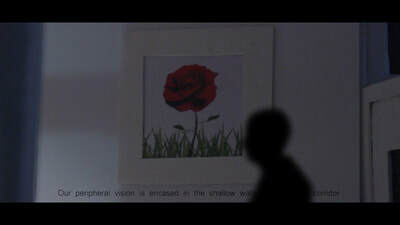 I was able to understand from one hospital alone the significance of shadow, time, voice and art on the walls. The space was silent, not an echo to be heard. Time stood still; I felt like I was in the space for hours when in reality it was only around 15 minutes. Shadows were minimal. The ceiling lights lit the space from all angles making it appear flat yet ongoing. Finally the art on the walls felt patronising. They abstract, floral shapes appeared to demand that I felt good about being in such a miserable space so synonymous to death. 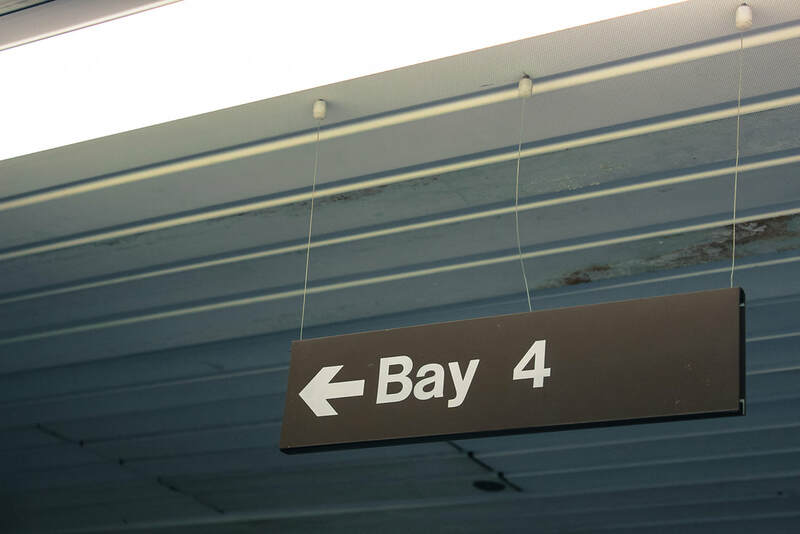 ​While in the space I thought hard about illustrating my points and therefore took photographs of the clocks, signs and long corridors. 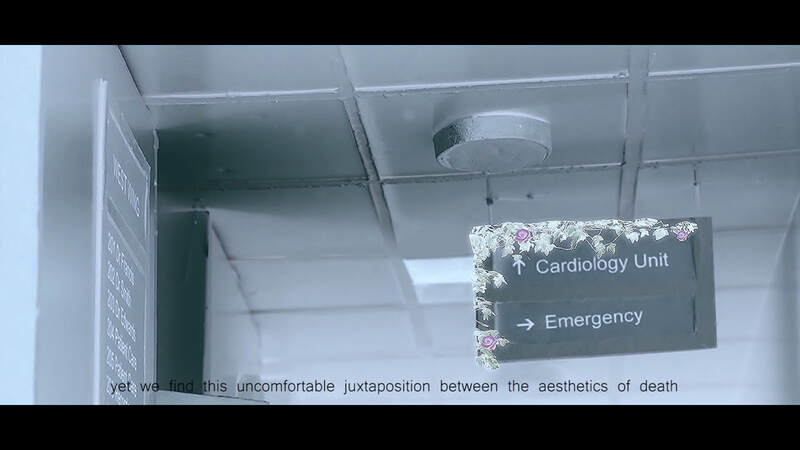 I had already been researching visual material to illustrate my points within my essay, during which I found a project online where an artist in Boston had visualised the uneasy juxtaposition between life and death in a medical setting. 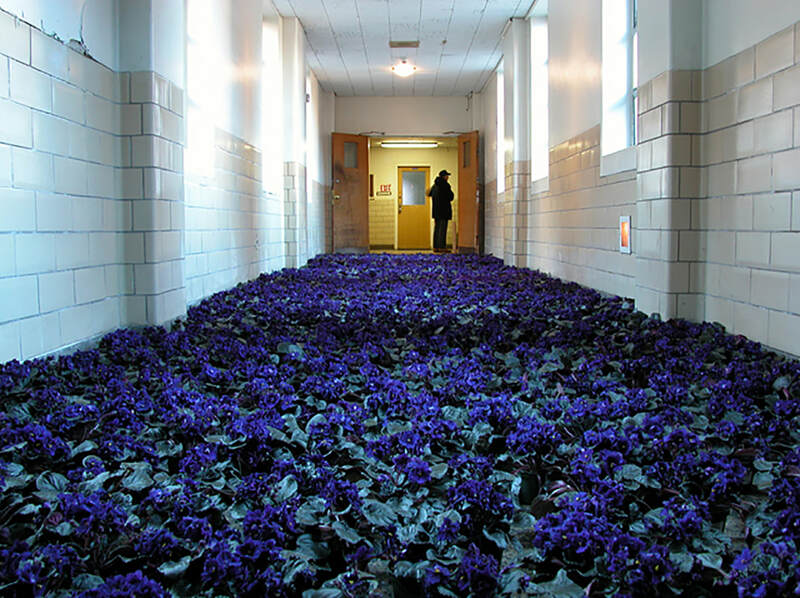 Bloom was a site-specific project for the Massachusetts Mental Health Center, Boston, MA which used 28,000 flowers in bloom and 5,600 square feet of live sod throughout the historic psychiatric institution to mark the persistent absence of life in hospital settings. While historically a place of healing, the drab interior, worn hallways, and dull paint needed a respectful infusion of hope. 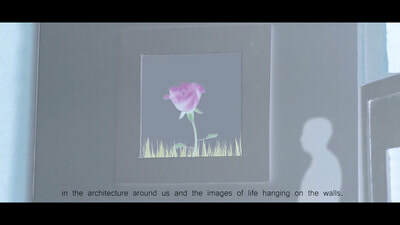 ​These quotes show how the archicture clearly contrasts the life and vibrance of the floral installation. 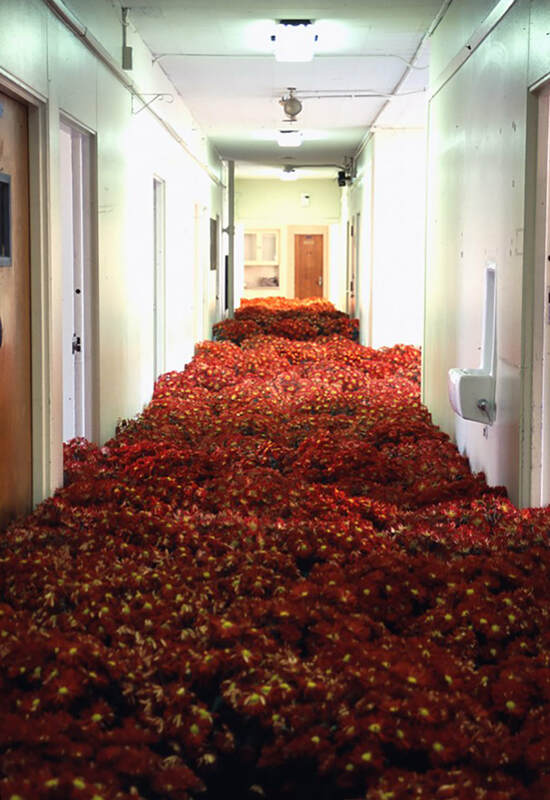 The project had such an impact on those who had spent so much time with the environment of a hospital. 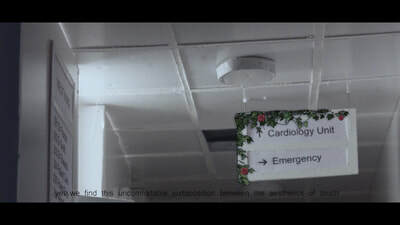 The plants became a symbol of life and hope, things that evade the typical space of hospitals other than the lackluster efforts of hanging artwork. 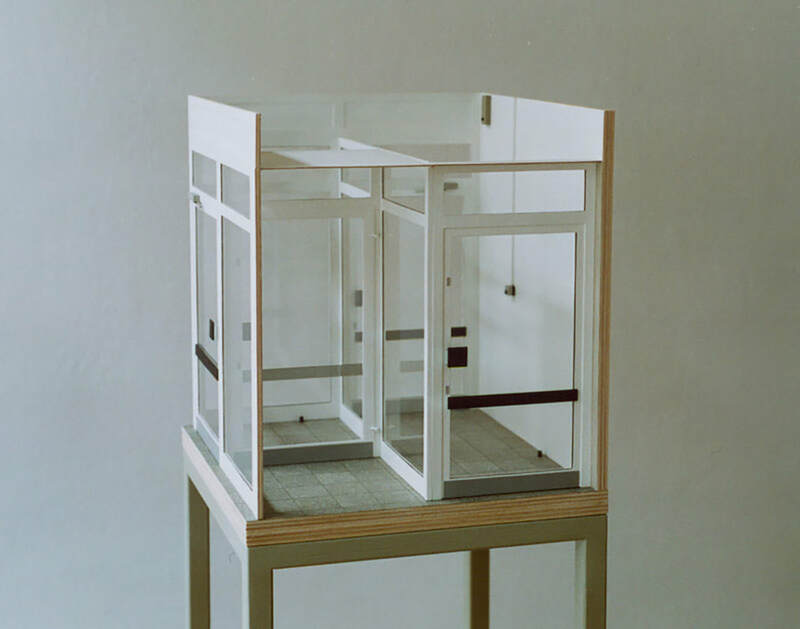 German cartoonist, designer and sculptor Jens Reinert has a personal look on everyday’s space. 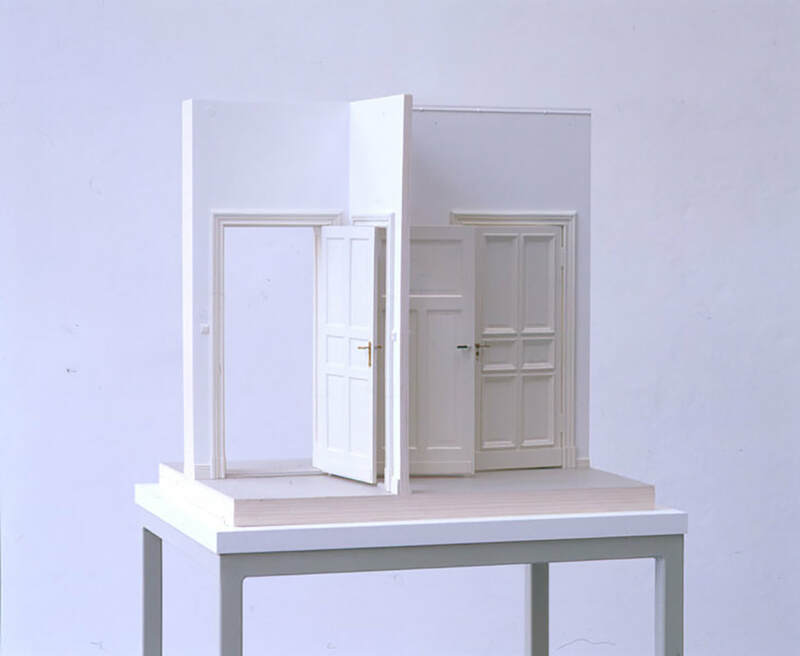 His works seem to preserve fragments of reality as it is, without contemplation or idealization. 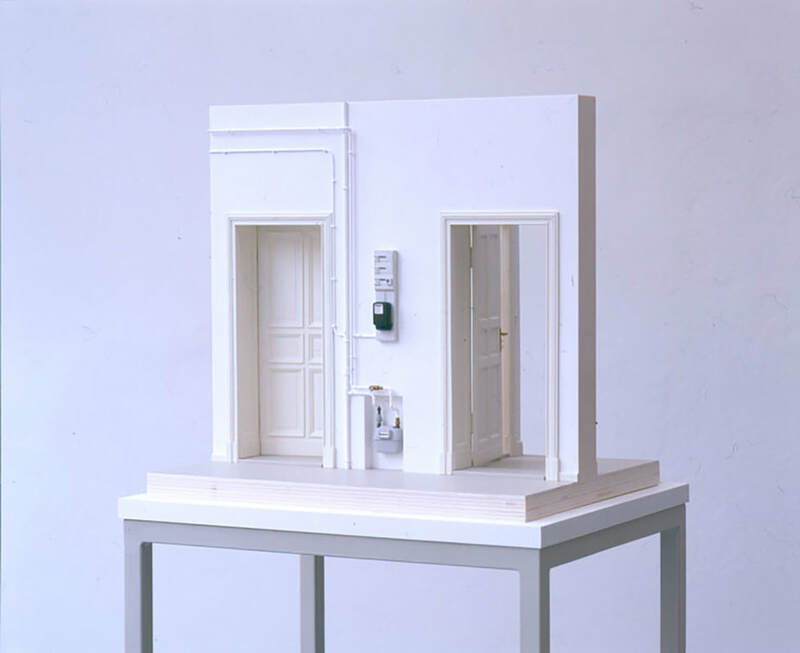 A central place in his production is taken by sculptures of negative volumes: metro station’s entrances, tunnels, buildings’ doors and staircases, mundane rooms, the universe of the average represented through decorated scale models within wooden boxes. 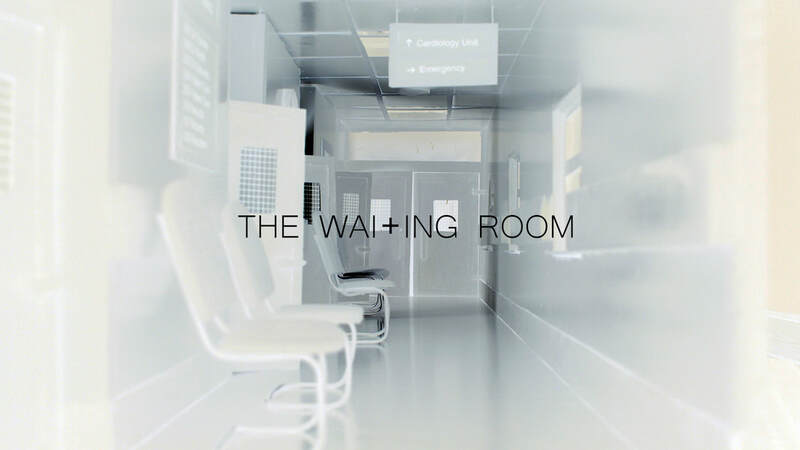 Using a similar process, I want to construct the reality of the hospital waiting room/corridor. 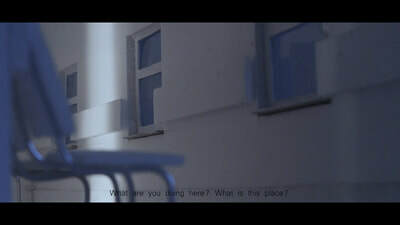 I would like for my model to look realistic in order to create an animation focussing on the temporality of shadows, time, voice and art on the walls. I want to convey the uneasy juxtaposition of life and death within my animation. I felt that making a model would better suit my ideas more than using other peoples' footage because of the lack of footage readily available. 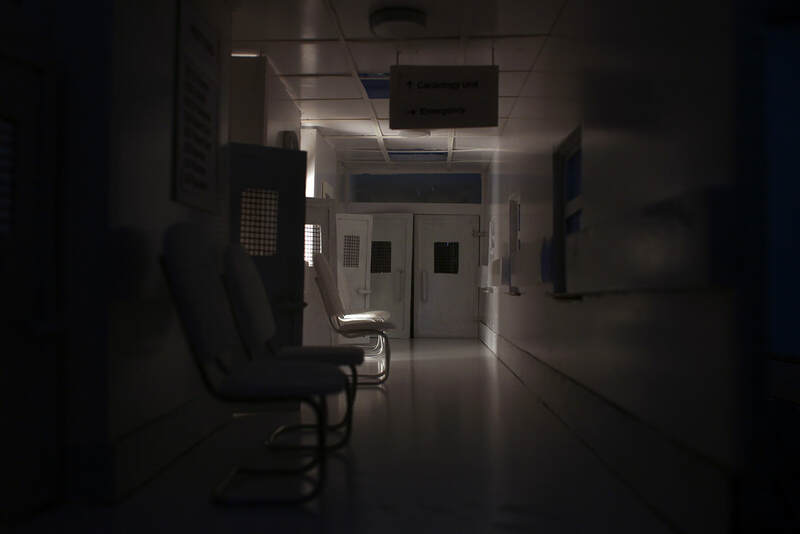 I found during my own first hand research that photographing or filming in a hospital was far more difficult than anticipated due to restrictions in privacy so making a scale model enabled me to explore the space without encroaching on peoples' private worries. To begin, I constructed the main shape of the room, a long narror corridor. This included the openings for the doors and windows. That was the simple part. 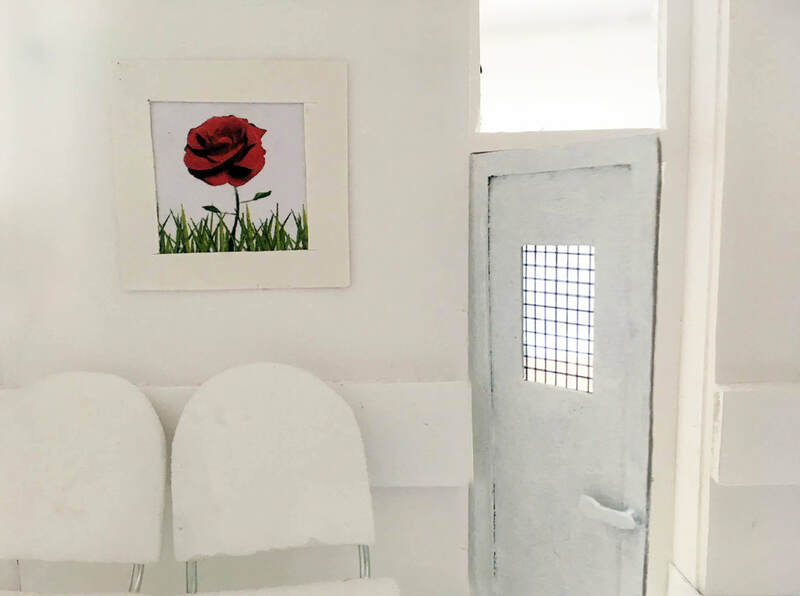 I next focussed on the more detailed objects which would be attached to the space such as doors, windows, clocks and hanging artwork. 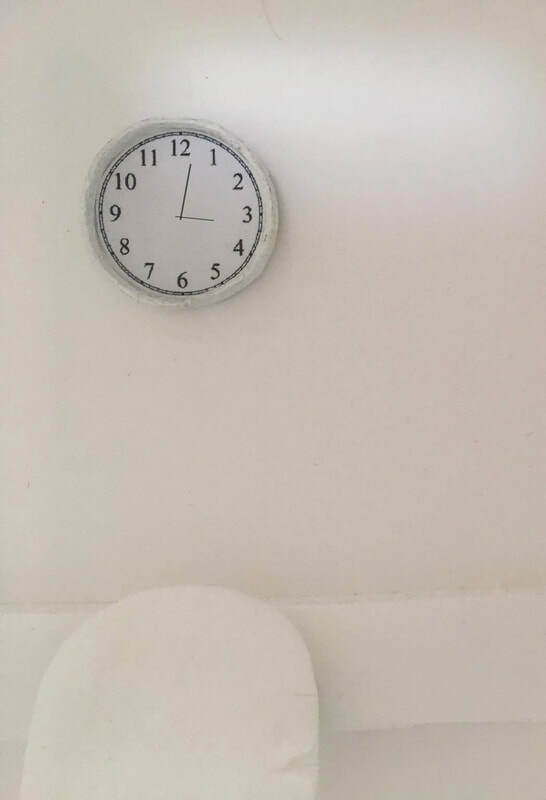 To highlight the aspects I plan to explore in my essay from temporality of shadows, time and voice to the art on the walls, I ensured the model had an element which I could use to visualise each of the ideas. 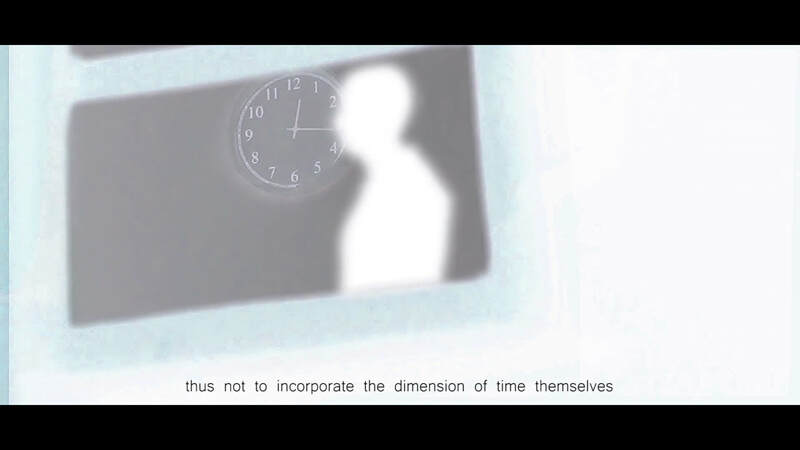 For time I included a clock whose hands I plan to animate. 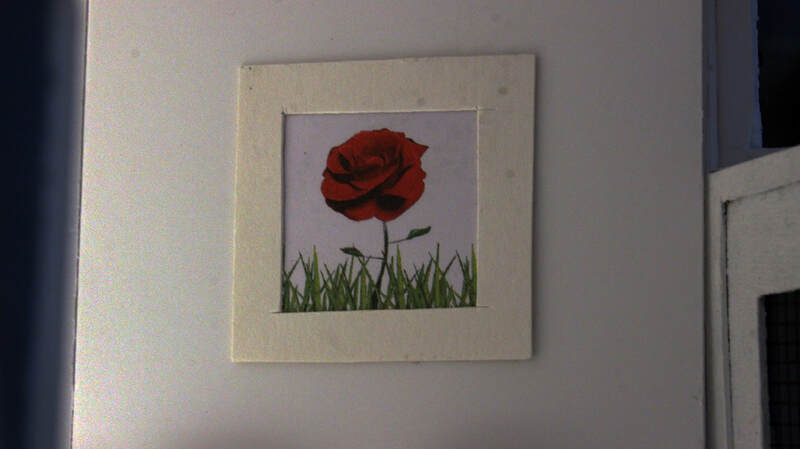 I included a hanging image of a rose bursting out some grass to contrast the souless, dead architecture of the building. 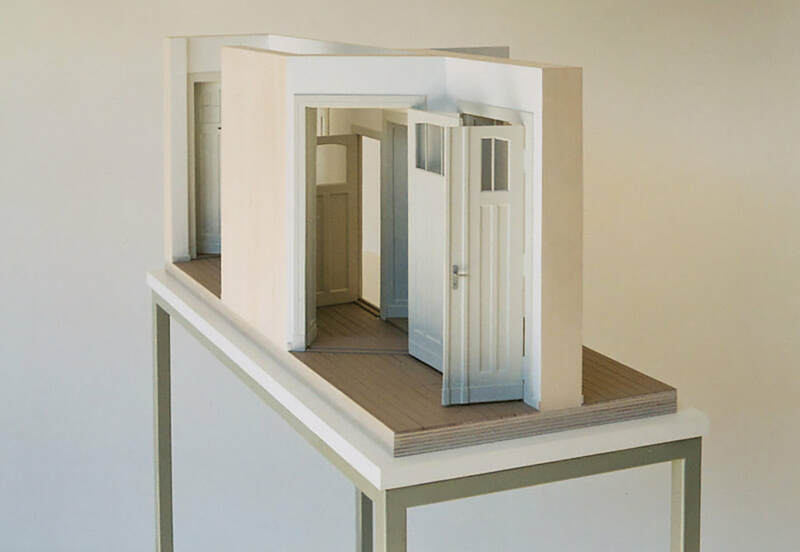 I utilised a lot of gaps in the building such as transparent windows, transparent ceiling lights and hatched glass on the room's doors to allow me to explore lighting the model to minimalise shadows. I will then include a voice over to explore the aspect of acoustics. 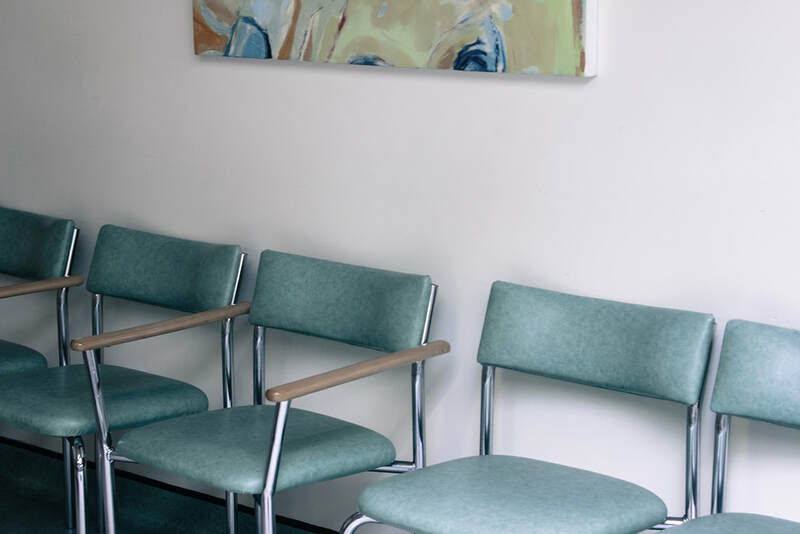 Deep shadows and darkness are essential in the waiting room because they dim the sharpness of vision, make depth and distance ambiguous. 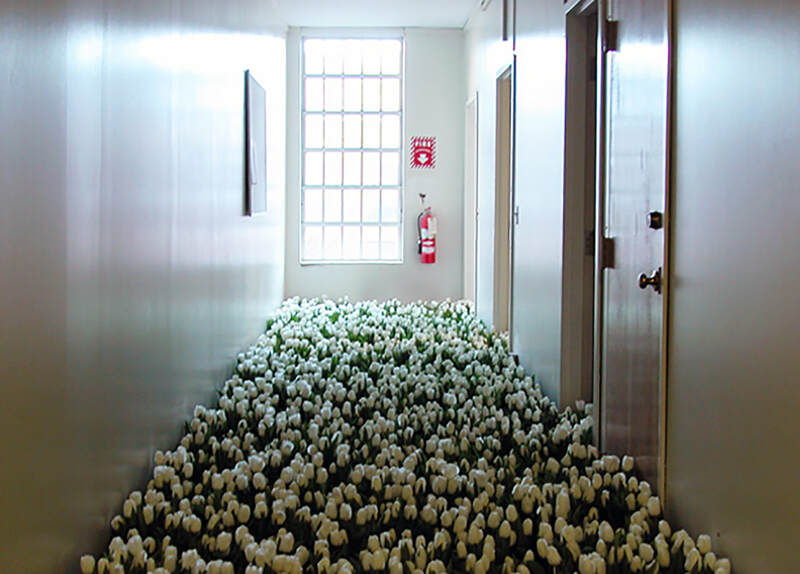 They invite unconscious peripheral vision and tactile fantasy. In order to think clearly, the sharpness of vision has to be suppressed, for thoughts travel with an absent-minded and unfocused gaze. The shadow gives shape and life to the object in light. In great architectural spaces, there is a constant, deep breathing of shadow and light; shadow inhales and illumination exhales light. 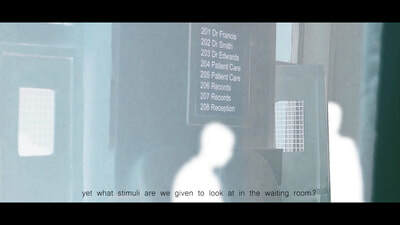 The waiting room however is lit from all directions meaning shadows are minimalised. Fantasy and imagination are prevented making the waiter forced to ponder their feelings of unwellness. To begin filming I set up my Canon 600D on a tripod so it was set at ground level on the model. I wanted the video to be quite intimate so the perspective was important in making the viewer feel encased in the space. I took some general, atmospheric shots of the space thus to introduce the viewer to the environment. 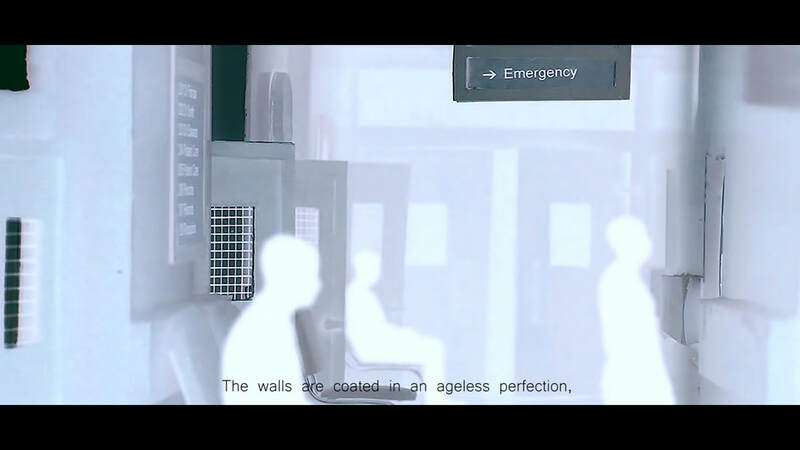 I ensured I clearly captured elements which made it clear the setting was a hospital such as the signage and the bright, white walls. Here I explored a number of lighting situations. I began by using a simple lamp to light the entire model however I later found that a stronger, more directional light worked best. 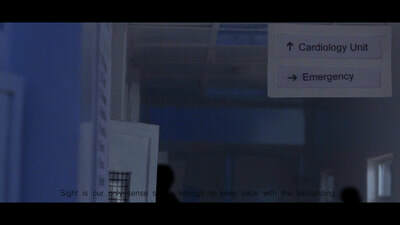 I was able to suggest life beyond the walls to insinuate the doctors in their spaces. 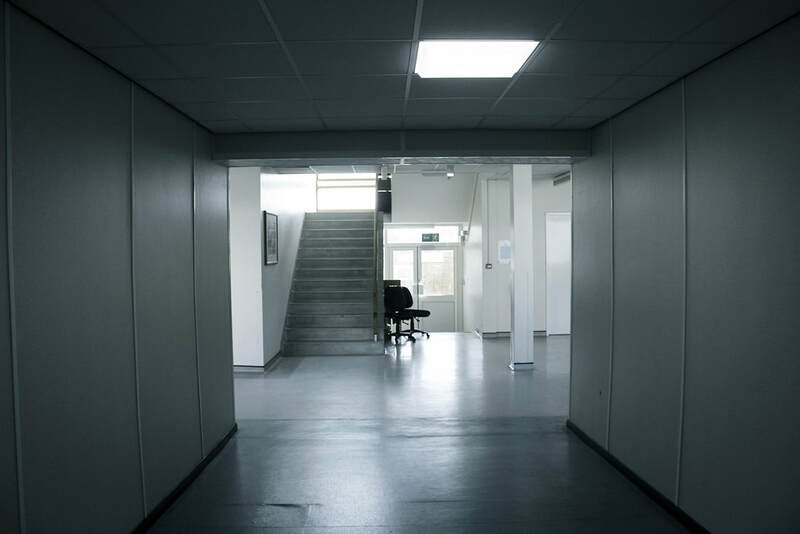 Doors opening and closing cast light on opposing walls and light through the windows suggested the sun, linking back to the entrappment people feel in the long corridors. 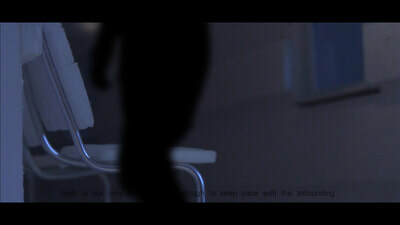 Following general model shots I began collecting the footage for the greenscreen elements of the project. I dressed my brother in all black including his face, neck, hands and feet and directed his positions ranging from looking out of the hospital window to sitting patiently in the waiting room. I then keyed out the white background so only the silhouette remained and overlaid this on the general model shots to make him appear in the setting. I added a gaussian blue to soften the lines but also to suggest a soul rather than a person to allude at death and the loss of life amongst the hospital architecture. 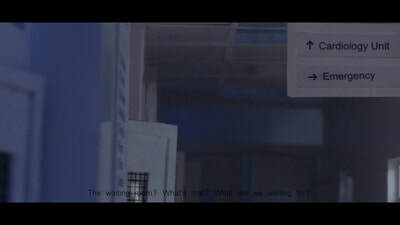 As you can see above, the greenscreening worked fairly well and the figures appear amongst the scene. In addition to the figures, I wanted to explore visually the contrast between the aesthetics of life and death through wildlife and foliage. 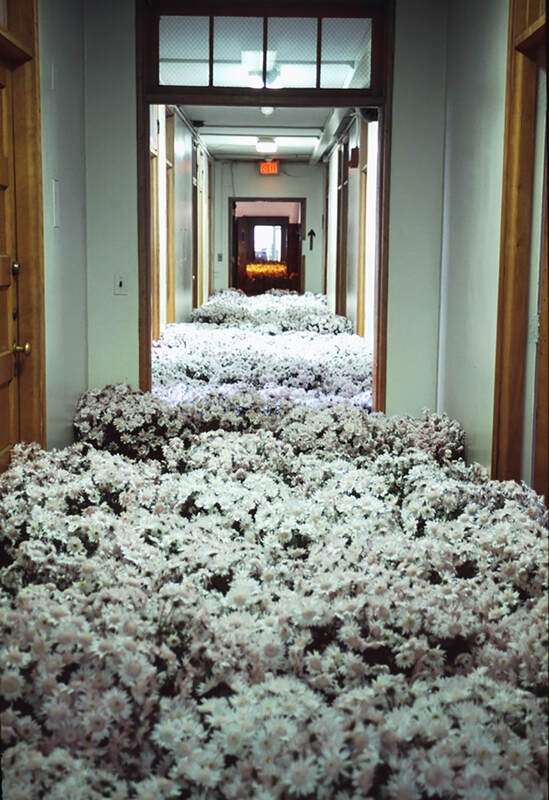 The Bloom installation as mentioned above was a large inspiration as to why I decided to include foliage as a symbol of life and hope to juxtapose the archicture. 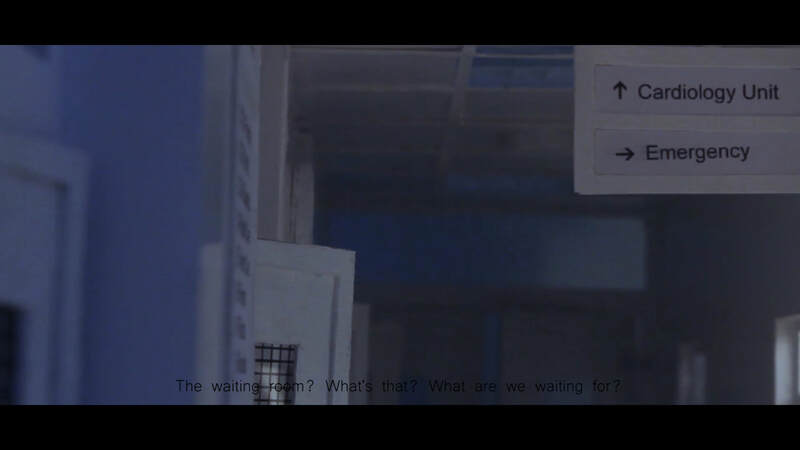 I'd have liked to have made these elements myself however my 3D modelling/animation skills would not fit my vision in my head due to technical capabilities so I decided to look elsewhere for footage I could key and greenscreen into the environment. Fortunately I found free footage online of a flower blooming and also vines climbing. Had I had more time I would have learnt to create something similar myself however the shot, 2 week nature of the project led me to source free material instead. After colour correction and a few hours of playing around with focus levels, saturation and brightness, I managed to make the foliage appear to sit within the setting. This involved a lot of layering and using masks on footage in order to make the footage fit in the depth of the corridor. For instance, in the bottom right GIF below, I had to mask out the foreground door to enable the vines to emerge from behing it. 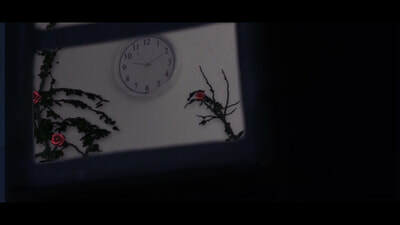 I also had to mask the chair and the clock so they weren't completely submerged by the vines. I also increased the blurriness as the vines fell deeper and deeper into the corridor thus to mimic the focus of the original model. Overall I feel this worked really well. What are you doing here? What is this place? The waiting room? What’s that? 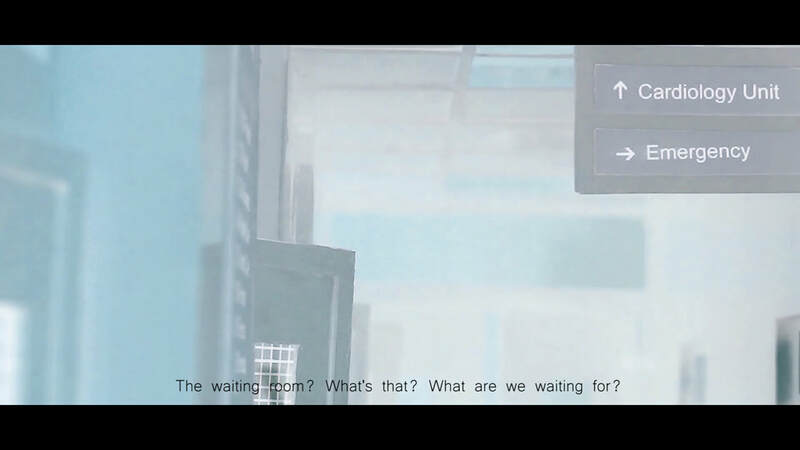 What are we waiting for? 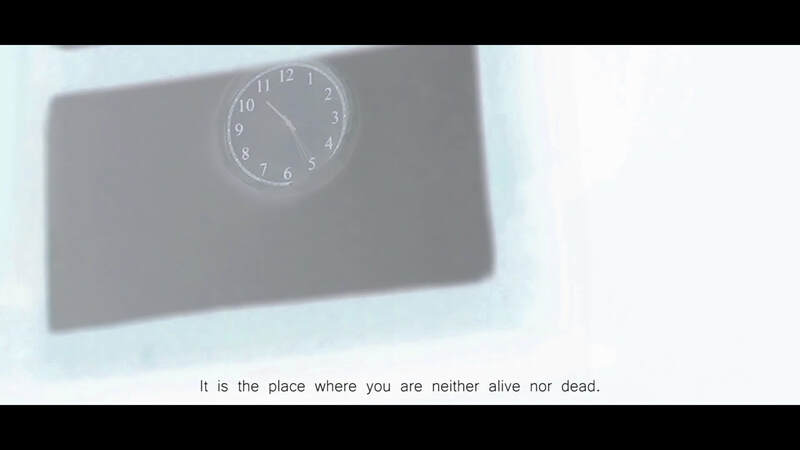 It is the place where you are neither alive nor dead. You’re in the middle. Time stands still. The walls are coated in an ageless perfection, thus not to incorporate the dimension of time themselves for they could arouse the fear of death in their traces of wear and tear. Shadows and darkness evade us to prevent our thoughts from clarity for thoughts travel with an absent-minded and unfocused gaze. 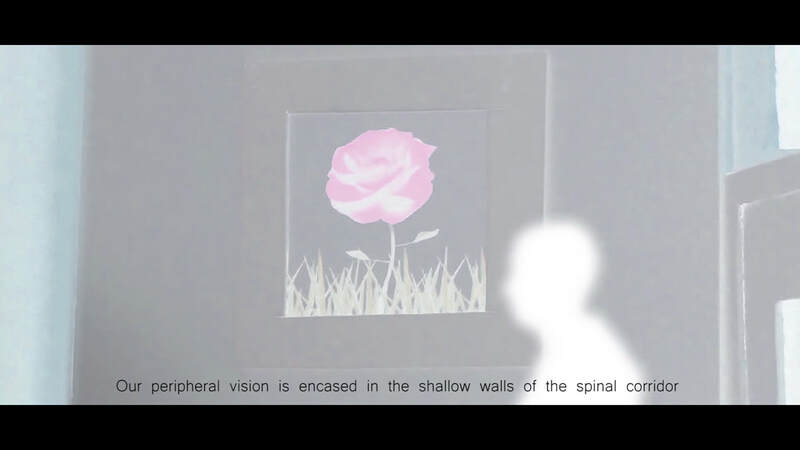 Our peripheral vision is encased in the shallow walls of the spinal corridor, disintegrating our senses, pushing us out of the space until we are mere spectators. Sight is our only sense strong enough to keep pace with the astounding increase of speed in the technological world yet what stimuli are we given to look at in the waiting room? We see uncanny images of nature that are intended to promote restoration yet we find this uncomfortable juxtaposition between the aesthetics of death in the architecture around us and the images of life hanging on the walls. Paintings of nature focus our attention on our very existence, once again making us aware of our fundamental solitude. A walk through a forest is invigorating and healing because of the essential interaction of all the senses. 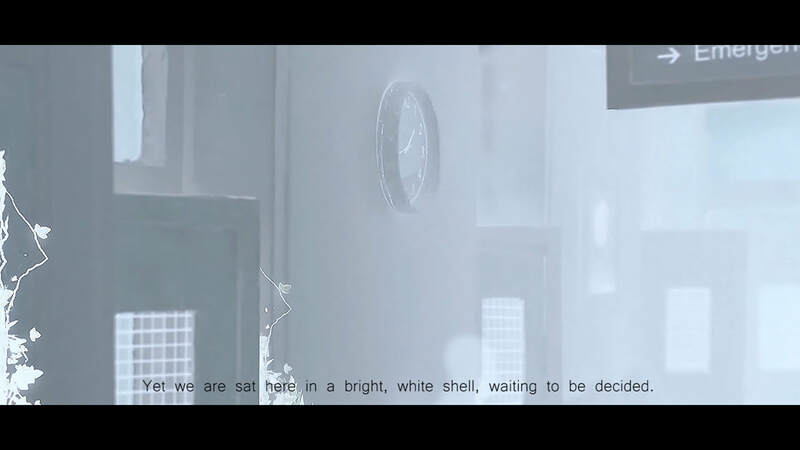 Shadows that are absent in the waiting spaces are cast within the vibrant greenery, reducing anger, anxiety and pain yet we are sat here in a bright, white shell, waiting to be decided. And do not ask who will be deciding on what to do with us. Because frankly, I don’t know. ​I asked two people I know if they were willing to record the dialogue and they agreed. I did find however that the text was too long for the 1 minute required video length. I therefore edited it down by cutting lines from the recording until it fit. Annoying the conditions the two voices recorded in were totally different meaning one had a lot of echo and the other didn't. 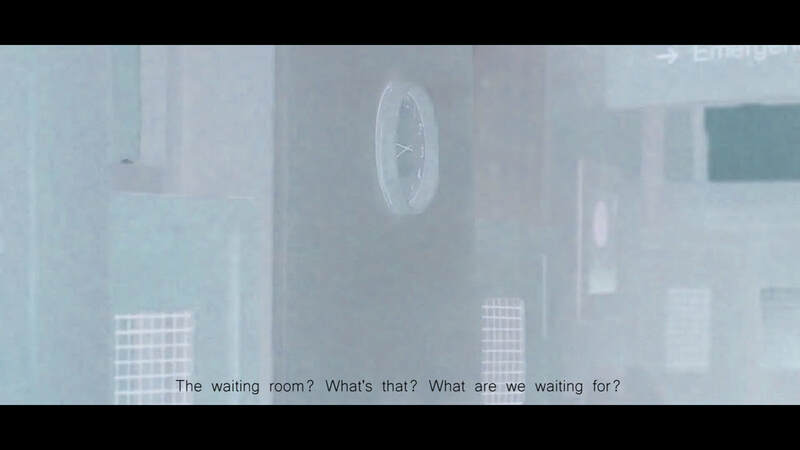 This resulted in the two voices appearing to be in different settings and not both sat in the waiting room. I therefore used Audacity, a free sound editing programme, to add an echo to one voice until they sounded similar. 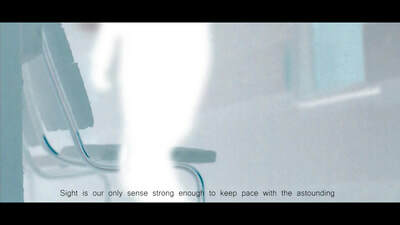 ​I also found the background noise to be different. There was a buzz in one and a hollow sound in the other. I therefore created two edits of the background noise to fit the entire composition so both vocals had the same background sounds. The buzzing sound I feel enhances the video and alludes at the electrical equipment you may find in a hospital setting. With all my footage, I opened Premiere Pro and compiled my clips in three parts, the first being general introductory shots of the waiting room, the second including silhouetted people and the final section including the juxtaposition between life and death through the introduction of plants and flowers. I was fairly happy with how the clips formed a narrative especially with the aid of the voiceover however the clips were not bright enough to suggest the harshness of the light in hospital settings. I therefore explored colour grading and correction. Since my footage was too dark at first, I decided to try altering the colours. 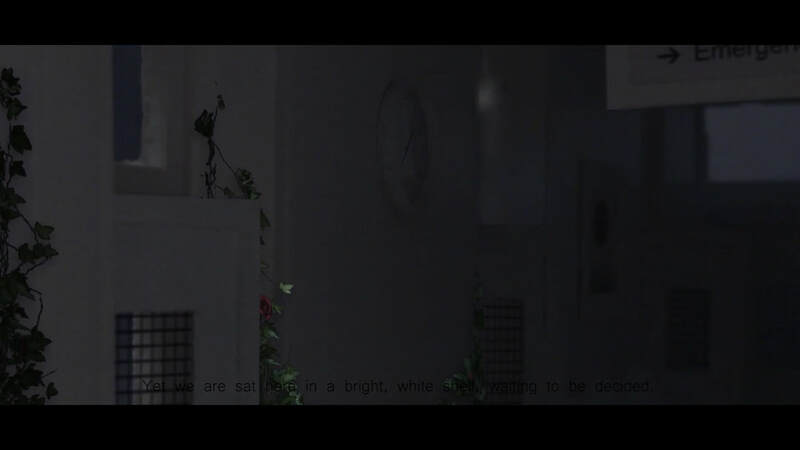 Increasing the brightness only diminished the quality of the footage so I later decided to invert the colours to see what happened. 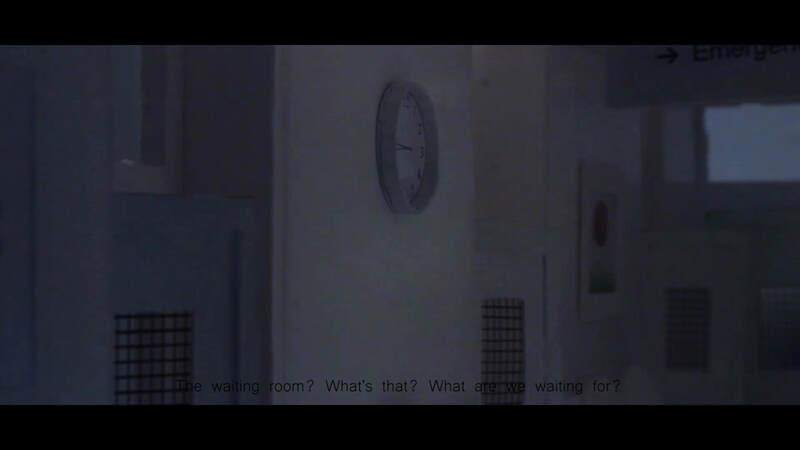 I found the footage became far brighter and more representative of the harshness of hospital lights however the inversion of colour meant to footage switched from a blue tone to an orange one. To get the footage back to the cold tones I used the 'hue/saturation' function. 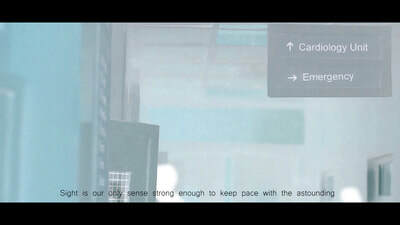 I next reduced the grain from the footage using After Effects grain remover. 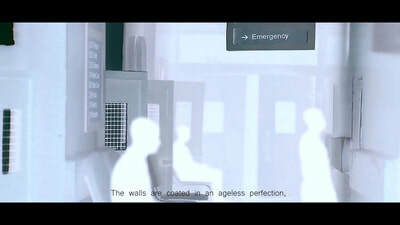 This made a world of difference in suggesting the smoothness of the materials of the hospital architecture. Finally I added some subtitles. Having to alter the voiceover did somewhat distort elements of the sound so the voiceover made the oral elements clearer. This also allowed the viewers to keep up with the sentence structure which could sometimes be a little long since I wrote it myself. Finally I uploaded my video to Vimeo with a self designed cover image where I once again inverted a photograph of the entire model from an onlookers point of view. My video was very well received in the crit to my surprise as I had a momentary panic that I hadn't done it right since my video was very different to everyone else's. We watched it once and it was concluded that it clearly demonstrated my topic in an interesting way. 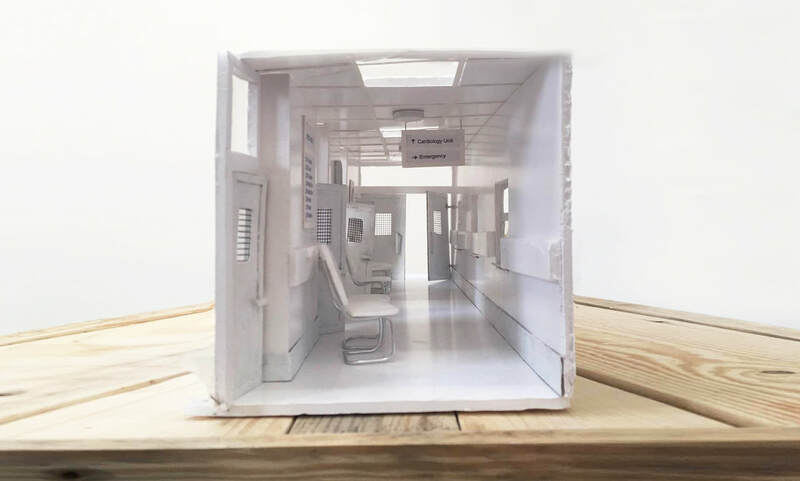 After a few questions from the tutors, I revealed that I couldn't actually get into a hospital to film footage so I had to make a miniature model. This took everyone by surprise as they thought it was real which was really flattering. Liz suggested I keep my essay philosophical since that's how I spoke about the topic after talking about how all places of goodbye such as hospitals, train stations and airports all have the same architecture. She mentioned I should continue making these connections and bring them into my essay in turn. Overall I was really pleased with the outcome of the project and how highly complimented it was during the crit. I'm proud of myself for pushing my ideas beyond the realms of research and into something unique and communicative.